Because of His Wounds, because His Sacred, Precious Blood was spilt, you have the opportunity to see the Face of God. As our Holy Father poignantly wrote at the start of his bull of indiction of the Jubilee of Mercy, “Jesus Christ is the face of the Father’s mercy.” That’s Christianity in a nutshell! It is something that every Christian knows, but too few truly ponder enough. Today, a week after Easter Sunday, the Church invites us to gaze upon and meditate on the wounds the Lord bore for us. He returns to His disciples in His bodily form without having disguised the wounds of His passion. He returns a battle scarred hero, displaying His wounds to us for our scrutiny, inviting us to touch and even enter into these very wounds, so that our faith may be restored, our own personal wounds healed, and our sins forgiven. It is only in the Gospel of John, in this particular passage, that we come to realise that Jesus was affixed to the cross by nails and it is only in the Fourth Gospel, do we have the story of the piercing of His side with a lance. 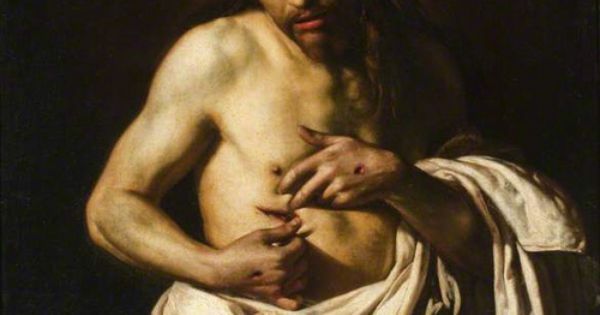 The other gospels have not one single word about piercing nails or thrusting spear or even physical and visible wounds on the body of the resurrected Lord. But isn’t it odd that the resurrected body of the Lord should have wounds? Isn’t the resurrection by definition a glorification, a transfiguration, a perfection, a total healing? Shouldn’t the resurrection remove every trace of old weakness, every hint of prior vulnerability? Why would the Fourth Evangelist deliberately take note of this seemingly trivial and yet scandalous point? To add further intrigue to the story, Our Lord offers Thomas precisely what he desires, without any rebuke. At that point, Thomas utters his confession, “My Lord and my God.” Pay special attention to this high point, perhaps the climax of the entire gospel; that it comes not immediately after the incident of the empty tomb, nor at Mary Magdalene’s discovery of the resurrected Christ, and not even on the lips of the ten who witnessed that very same resurrected body walk through closed doors. No, these words that mark the “High Christology” of St John, where he surpasses the other evangelists in the honours, titles and privileges heaped upon Jesus, is found on the lips of the one who demanded to see the wounds of Christ. The wounds of Christ would be the very reason for this confession of faith. Thomas sees the wounds and he sees God. This is at the very heart of our Easter faith. A Jesus without wounds is a Jesus without a cross and a Jesus without a cross would never be adequate to meet the deepest needs of mankind. Too many modern Christians have clasped to their bosoms a powerful but cross-less Christ. That kind of Christology will always have at its corollary a cross-less discipleship. A cross-less Christ, a God insulated from pain and suffering, will produce followers who believe they should enjoy the benefits of a special relationship with this lite-version of Christ. They become touchy ‘Christians’, ‘Christians’ who get offended easily. Every small little demand made of them would seem impossibly heavy. These ‘Christians’ will look to their false image of Christ for “blessings” of success and privilege, and these become evidence, that they enjoy divine approval. But to worship such a Christ would be to worship a false Christ – an anti-Christ. This is the incredible reality of the Christian faith. We do not worship a God who gives us life lessons on how to be happy or a God who sets out a strategy for how to avoid sorrow. We do not worship a God who remains aloof, untouched by our pains and sorrows. We worship a God who has chosen to, as the Malay expression goes, “turun padang,” go down to the grassroots of unwashed humanity. Yes, we worship a God who has experienced the most profound sorrow of suffering. He suffered for us and He suffers with us. And He has the scars to show for it. When Thomas sees Jesus and believes, he sees the wounds. He looks at the wounds. He does not see the evidence of man’s depraved cruelty but rather, he sees beauty, the beauty of the self-sacrificial love of the One who willingly chose to die for us. He sees the face of God’s mercy. We too need to see them to believe. We must let it sink in and remember that Christ did this for us. The wounds that mar Christ are the wounds that mar us all, transferred from us to him. In His death, every needless death is absorbed. Every drop of blood ever shed is seen in His death. Every sorrow is seen in His sorrow. Every tear of mourning and loss is understood by Him. God attends every funeral and whispers, ‘I know how this feels’ to everyone who will listen to His quiet voice. Our wounded God has redeemed every wound. Our murdered God has redeemed death. Our broken God has redeemed brokenness. Our bereft God has redeemed mourning. And, we will recognise Him by his wounds.